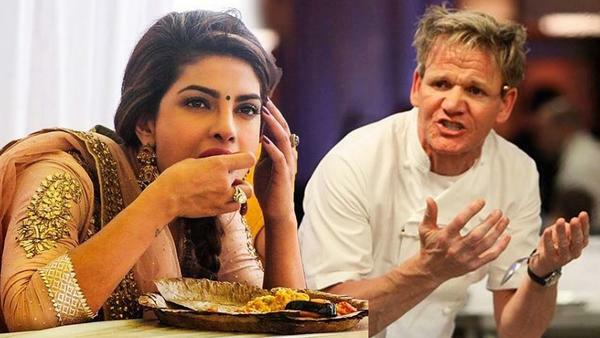 Gordon Ramsay Disses Priyanka Chopra's Cooking! Priyanka Chopra recently appeared on a chat show along with Gordon Ramsay. You may be aware that chef Gordon Ramsay is famous for his saucy criticism about food cooked by people. He is so infamous for his sarcy comments that people all over the world ask him to comment on their dishes via Twitter. In line with this trend, host Andy Cohen showed Gordon pictures of some dishes cooked by various celebrities. Amongst these was an image of Priyanka's chicken soup and khichdi tiffin boxes. As soon as he saw this image, Ramsay said PeeCee's food looked like a dog's dinner. His exact words, "Sh*t...I mean it looks like a dog's dinner!" It is true that the soup and khichdi bowls were not attractive food or attractively plated like people trying to show off their cooking. The image was from Twitter and the food was just tiffin boxes that Priyanka had taken to her sick friend and co-star from Quantico. Gordon saw the box of khichdi, but what he did not see was the love and care that PeeCee offered to her sick friend. Isn't that also an important element of food? Popular Sitcom Khichdi Set to Make a Comeback on Telly! How Does Gordon Ramsay Scramble His Eggs?